Super Premium Oatmeal is a HIT! 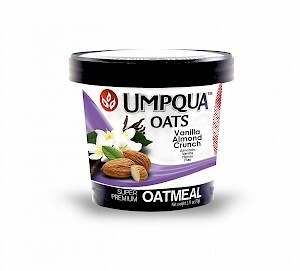 Typically I don't like the "quick" oatmeals, but Umpqua is different. Just add hot water, recover and let it steep for three minutes and it came out perfect! The groats themselves are nice and big and the addition of the granola and nuts give it a terrific texture. One cup is just over 300 calories and delivers 6 grams of fiber and 9 grams of protein. Now the bad news...it also has 15 grams of sugars and frankly for my taste buds its a little too sweet. A little less vanilla and honey and this would be the ultimate mid afternoon pick me up.